Finca el Moralejo is a holiday park with apartments and villas in a rural setting. Our holiday park is situated in the province of Malaga, in the by UNESCO protected "Sierra de las Nieves" natural park. An area of natural beauty where the typical white Andalucian villages fill in the landscape. The shore and beaches of Costa del Sol are just over a 30 minute drive away and only a 45 minute drive from the airport of Malaga. Situated on what is probably the most beautifull road of Europe, the A366 towards the historical city of Ronda. Between two authentic Andalucian villages Alozaina and Tolox. Finca el Moralejo has spectucalair views over inland mountains, olive groves and even on clear days the Mediterranean sea. Nature parcs that are in a radius of a few hours from the complex can be visited. For hikers, bikers this is a pleasure ground. Finca El Moralejo gives you all the ingredients to relax both actively and passively. Walking, cycling, horse riding or swimming in the river Rio Grande, or enjoy our pool, playground, football field etc. etc. Finca el Moralejo is a family run business. We: Peter (Dutch) and my wife Nice (Colombian) met in the early 90s on Bonaire, an island in the Caribbean. We got married and quickly followed three boys. After experiencing the best years of Bonaire we wanted to give our kids some more educational soil and after three exploring trips to Spain we fell in love with Andalucia, especially the inland white villages where we felt the same rural atmosphere that we enjoyed from the early Bonaire days. Since 2003 we are the proud owners of Finca El Moralejo and cooperate with La Casita Holiday Homes, for which we manage surrounding private villas. We speak Spanish, Dutch, German & English. 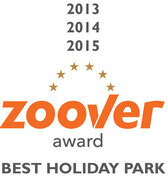 Three years in a row voted best Holiday Park in Spain by Zoover, high ranking from facebook through Tripadvisor prove that Finca el Moralejo has a right to sell fun. Your well being and holiday are attended by us personally. This is not a money motivated job, but we love and need to share paradise in order to maintain it. You won't find us on booking.com or other booking sites, our reservation office is exclusively through www.lacasita.com.